Xinyu Dai, professor in the Homer L. Dodge Department of Physics and Astronomy, OU College of Arts and Sciences, with OU postdoctoral researcher Eduardo Guerras, made the discovery with data from the National Aeronautics and Space Administration's Chandra X-ray Observatory, a telescope in space that is controlled by the Smithsonian Astrophysical Observatory. "We are very excited about this discovery. This is the first time anyone has discovered planets outside our galaxy," said Dai. 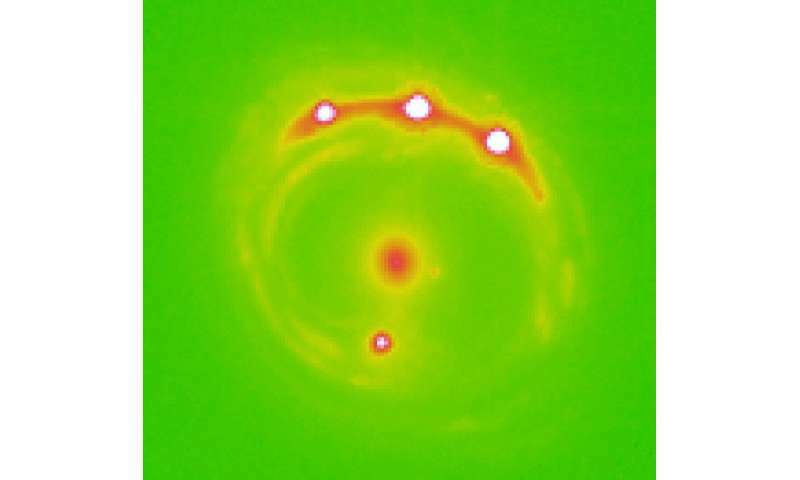 "These small planets are the best candidate for the signature we observed in this study using the microlensing technique. We analyzed the high frequency of the signature by modeling the data to determine the mass." "This is an example of how powerful the techniques of analysis of extragalactic microlensing can be. This galaxy is located 3.8 billion light years away, and there is not the slightest chance of observing these planets directly, not even with the best telescope one can imagine in a science fiction scenario," said Guerras. "However, we are able to study them, unveil their presence and even have an idea of their masses. This is very cool science." A paper, "Probing Planets in Extragalactic Galaxies Using Quasar Microlensing," by Dai and Guerras on this study has been published in the Astrophysical Journal Letters. Previously, planets have been detected only in the Milky Way galaxy. Here, we show that quasar microlensing provides a means to probe extragalactic planets in the lens galaxy, by studying the microlensing properties of emission close to the event horizon of the supermassive black hole of the background quasar, using the current generation telescopes. We show that a population of unbound planets between stars with masses ranging from Moon to Jupiter masses is needed to explain the frequent Fe Kα line energy shifts observed in the gravitationally lensed quasar RXJ 1131–1231 at a lens redshift of z = 0.295 or 3.8 billion lt-yr away. We constrain the planet mass-fraction to be larger than 0.0001 of the halo mass, which is equivalent to 2000 objects ranging from Moon to Jupiter mass per main-sequence star. "It's wondrous (out there), with treasures to satiate desires both subtle and gross. But it's not for the timid." Billions of planets in billions of galaxies, or maybe, trillions of planets in trillions of galaxies. The more time goes by, the more this quote from Star Trek, like many others, looks right. ........and still no DM Cosmic Fairy Dust observed. Yet the scientific principles, which are the basis of the technology developed for the research described in this article? Continue to support the hypothesis that DM exists. And explains why it is invisible to all but gravitational influence. The only failure Benni? Is in your lack of competency to understand scientific evidence. I can solve Differential Equations, what's the level of your math skills? Guys, he can solve differential equations. He's darn well qualified. It's not the pinciple but the priori foundation. "Give me one small miracle and we'll explain the rest" that's why the hypothesis exists, but it's completely unnecessary. A big part of it is the stupidity in thinking math is empirical evidence. There is no one to one relationship to reality and our calculations have led us astray as evident by science history. Garbage in = garbage out. For a generation the vertical electric field was denied by established science because we had the math to prove otherwise. Closed minds like Captain stupid and Jones Dumb shutting down science progress because of personal beliefs to arrogant to consider maybe they don't know what they don't know. Closed minds like Captain stupid and Jones Dumb shutting down science progress because of personal beliefs to arrogant to consider maybe they don't know what they don't know. Wrong, woo boy. We dismiss the idiotic rantings of EU nutters because they are scientifically illiterate junk. Electric Sun? Lol. Electric comets? That went well, didn't it? Electric craters? Dear me. See what I mean? It's all predicated on the moron Velikovsky's lunacy. Nobody takes that s*** seriously. In short, EU is crap, followed by a bunch of scientifically illiterate mythologists. .........ask Schneibo. You already screw up one of the most simple DE's anyone can put up, now you try another. You Journalists should first learn to do Algebra before copying stuff off the internet like you did this one. So, let me get this right. You do not recognise this simple differential equation? LOL. LOL. LOL, Oh please stop, you're killing me! What if I solved it for you.....? Do you recognise it now? he absolutely does *not* recognize it because he's lied this whole time about being able to do differential equations - heck, he can't even do basic math! Hey Zzzzzzzzz go back to sleep pin head at least Jones can offer substance.